Whether you're looking for a new honey hole or the gear to land a lunker, we've got you covered. Swing hard, tight lines. Pond Meadow Pond, which is part of the Pond Meadow Park, is a very lively pond with fishing jumping out of the water everywhere you look. It is a challenging pond as there are only a few access points and it is covered in weeds and lilly pads. Currently there are very low water levels all across the state but when the water comes back up it should be easier to fish. To access this pond, you need to enter the park on Liberty St. Depending on which spot you want to fish, there are different parking lots located around the park for easier access. The northern most spot marked on the map is the closest to a parking lot so if you don't feel like walking I suggest heading there. As for the fishing, you need to have a weedless set up if you want to avoid hours of getting stuck and pulling weeds off your hooks. The middle of the pond seems to be nearly as shallow as the shores so expect to see a lot of fish giving you targets to cast towards. You're best off using a Texas rigged worm or a weedless frog. If you want to get a boat in there, you can probably get one in at the northern most access point but anything with a motor is going to constantly getting stuck in the weeds. Although, since Pond Meadow Park is a conservation land, I highly doubt that boats are even allowed in the pond. You'll have to check with the park office for that information. With the limited access and amazingly vegetative waters, Pond Meadow Pond, is an isolated, rarely fished pond with plenty of fish to be caught. One thing to keep in mind is that the park locks their gates at 7 PM so if you've parked within the gate limits, make sure you're out of there by then. Moms are the precious gift that God has given to us, without them we are not in this world. So as we celebrate Mother's day let us all thank our moms for giving us the chance to live and to see how beautiful the world is. Visit my site for more information. The real necklace of a woman is not her looks but her heart. Visit my site for more interesting offer. Thank you and God bless! Water alternatives are wonderfully vivid and lovely like your post. To make them manage pond proficient Pond Repair is a gift. Boats are allowed with no motors, it is so weedy that any prop would immediately get fouled. It is a great canoe spot, shore fishing is ok, limited due to weed beds. Great pockets and natural cover to fish in, accessible mainly by canoe. If in a canoe, please pick up any litter and line, etc. Secret tip: try canoeing by the docks and shore fishing spots, there are alot of bushes and trees that people get hung up on, great chance for free lures. 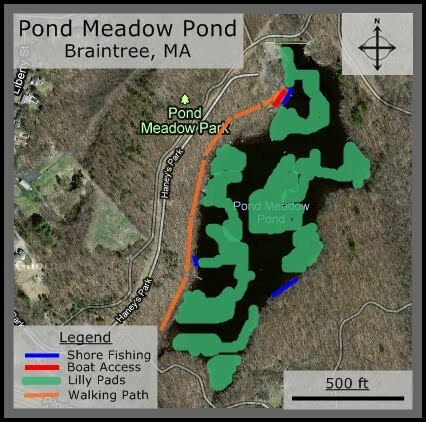 Thank you bass fishing for this really informative post on Pond Meadow Pond and also on best bass fishing lures. Pond Meadow Park, is a very lively pond with fishing jumping out of the water, one of the best place to be at.